Alex you must have an axe to grind. TONES was the best and safest pub i have ever been to. I would often take my wife, my kids, my nephews, & never ever saw any trouble in the place. Thank you, Chelseam and Maggie8. You accurately portray the unrefined, uncultured, uneducated, anti-social behaviour of those wannabe wags, who were so attracted to this thankfully deceased bar. You also correctly represent the aggressive personality disorders of those who flocked here to scrape their knuckles on the floor and graze them on somebody else's face. [Just one of the reasons why this venue was regularly brought it to the attention of an increasingly disapproving Sutton Police Force]. Thankfully, my deliberately brief visits to this venue were never long enough to �get a slap� as you understatement suggests and I�m certainly not bitter. It should be profoundly obvious from my comments that I am overjoyed to see this pond life magnet disappear forever! Though the venue is currently unattractively boarded up, the last time I passed by, at least the pavements looked and smelt rather more attractive, without a composite layer of urine, vomit, broken glass and what looked to be occasional spots of dried blood. I am, however, intrigued to know (or rather, avoid) the current venue(s) of your 'slap happy congregation�, who formerly frequented here � would it be Brixton and Holloway Prisons by chance? Did you get a slap in here or something Alex_Bradford. 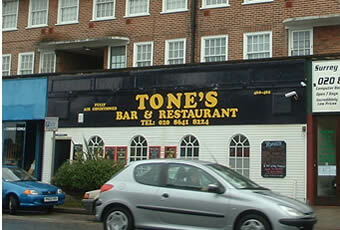 It is with the greatest of pleasure that I can confirm that the notorious Tone�s Bar is PERMANENTLY CLOSED. No longer will the pavements be paved with urine and resemble a minefield of broken glass. Gone are the days of the sight of half-cut chavs, wobbling back to their white vans. Departed are the sounds of confrontations between tattooed women with tourettes and covered in the latest range from Elizabeth Duke. Vanished are the 200-decibel conflicts that echoed around a half-mile exclusion zone. As a result, North Cheam is probably the only place in Britain where house prices have actually gone up in recent months. With the anti-social campaign that has blighted the lives of locals for so many years being finally over, I�m surprised there wasn't a WW2 Victory style street party! Chav city and young offenders reunited on the inside, broken bottles and urine stains on the outside - keep walking.